Our event marketing team spends a lot of time on the road. But that time is well spent when you can share it with over 870 students from 60 colleges. 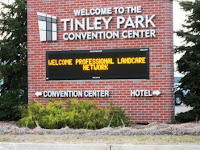 That’s what happened when the nation’s top horticulture and landscaping students converged on Joliet Junior College in Joliet, Ill., for the 35th annual National Collegiate Landscape Competition. The event was held March 16-20. The competition is an annual three-day competition, networking and career development event for students enrolled in green industry programs at two- and four-year colleges and universities from across the country. 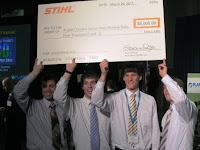 STIHL Inc . was on hand as the sole platinum level sponsor and organizer of two competitions. We at STIHL are excited to be a part of this important event. These students are the future of the green industry, and their passion and determination continues to inspire us year after year. This year’s top honors along with a $5,000 check from STIHL went to Brigham Young University-Provo. 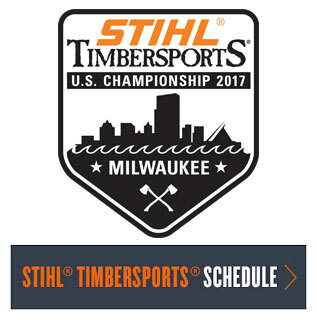 In addition to being the lead sponsor of the event, STIHL also was the lead organizer and sponsor of two competitions; Wood Construction and Small Engine Repair. Donnie Hill of DL Hardscapes planned and managed the Wood Construction event, and Eddie Anderson, technical training supervisor from STIHL Inc., led the Small Engine Repair event. Over 40 schools were involved in the engine repair event, where a written placement exam determined the top 10 contestants who then went on to a timed practical application event in real-world conditions. 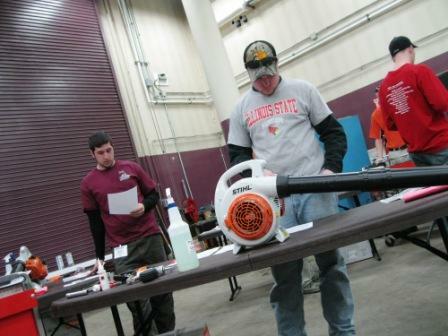 In the months leading up to the event, participants trained with materials provided by STIHL Inc. and also with regional STIHL technicians or local STIHL dealers. Trenton Spratling of Brigham Young University-Provo won the event with an overall score of 98.8 earbning a $100 STIHL certificate for himself and a STIHL technician tool kit worth $1000 for his school. As a way to further encourage students involved in the study of landscaping and horticulture, we also provided funds for the top two national FFA Nursery and Landcsaping CDE teams (Southern Alamance FFA from North Carolina and Washington County FFA from Kansas) to travel to PLANET Student Career Days and compete in four college level events. 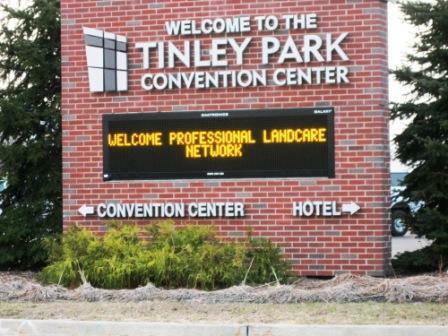 We have sponsored the National FFA nursery and landscaping competition since 2003 and think that this experience introduces the high school students to college programs from around the country, and lets them meet prospective employers at the Student Career Days Career Fair. For more information on the events visit www.landscapeprofessionals.org/collegiate-landscape-competition. For more photos of the event visit the STIHL USA Facebook Page.